Mister Rogers arrives with a collapsable felt board which he takes to the kitchen table where he uses pieces of of felt to make colorful designs. He thinks about the shapes moving on their own and arranging themselves to look like objects such as a house and a boat. At Negri's Music Shop, Mister Rogers tries out a new accordian. Joe Negri joins him on guitar as they play a wonderful instrumental of Everybody's Fancy. Mister Rogers thinks he may practice the accordian for the upcoming variety show. Mr. McFeely stops by the shop to practice a tap dance routine he is planning for the variety show. 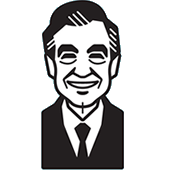 He and Mr. Negri go into the back room while Mister Rogers watches the music shop. In the Neighborhood of Make-Believe, Lady Elaine Fairchilde has ordered an accordian and Handyman Negri helps Mr. McFeely by delivering it to the Museum-Go-Round. Thrilled to start playing her new accordian, Lady Elaine surprises Handyman Negri with her musicial talent. At Someplace Else, Mr. McFeely is making a delivery as Lady Elaine arrives to show off her talent and is introduced to Harriett Elizabeth Cow. Ms. Cow compliments Lady Elaine on her accordian playing and expresses her interest in seeing the Museum-Go-Round. Much to Lady Elaine's surprise, she and Harriett Elizabeth Cow have many common interests. Back at the music shop, Mr. McFeely continues practice his tap dance routine as Mister Rogers and Mr. Negri play Everybody's Fancy. With the variety show in mind, Mister Rogers decides to purchase the accordian. Returning to his house, Mister Rogers is visited by Mrs. McFeely who asks him to play Everybody's Fancy on his new accordian so she can prepare for her part of the McFeelys' tap dance routine. When she stops by Mister Rogers' house, Mrs. McFeely does not actually practice her tap dance routine. Instead, she just wants to get the "tune [of Everybody's Fancy] in mind" so she can rehearse on her own. Lady Elaine Fairchilde mentions that took accordian lessons when she was young. Her teacher was "Frances Pebiola in Latrobe."